Chalkupy can be designed but not controlled. 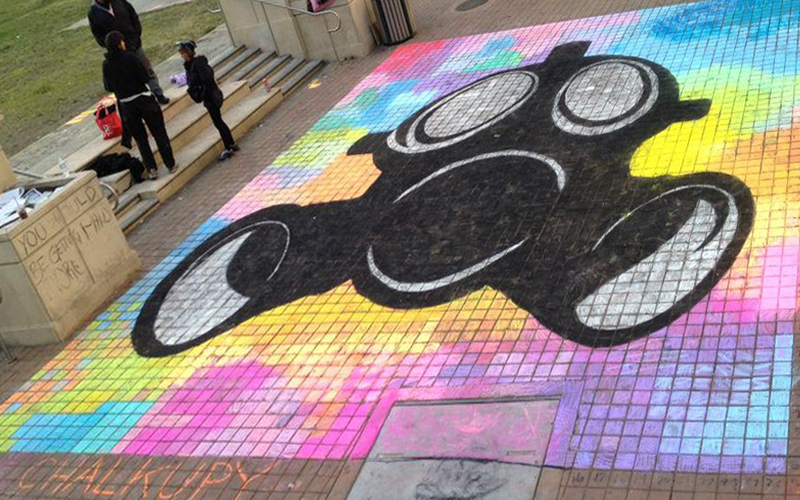 The most common misconception about Chalkupy is that it is more organized than it is. The plazas are public spaces. There is no way to control the people who show up but we try to set it up to go well. Invite anyone and everyone to have juice, sing, dance, party and chalk if they please. You’ll find that most people who participate take personal ownership of whatever part of the event that they want to. They self-evaluate, decide what they want to do, whether it’s drawing something complicated, filling in, keeping our stuff from being stolen, keeping the area clean, DJ-ing, handing out flyers and pizza or just getting in the way. Remind people about the event, buy and sort the chalk, prepare drinks, design maps and information and most importantly design or choose the theme and image. 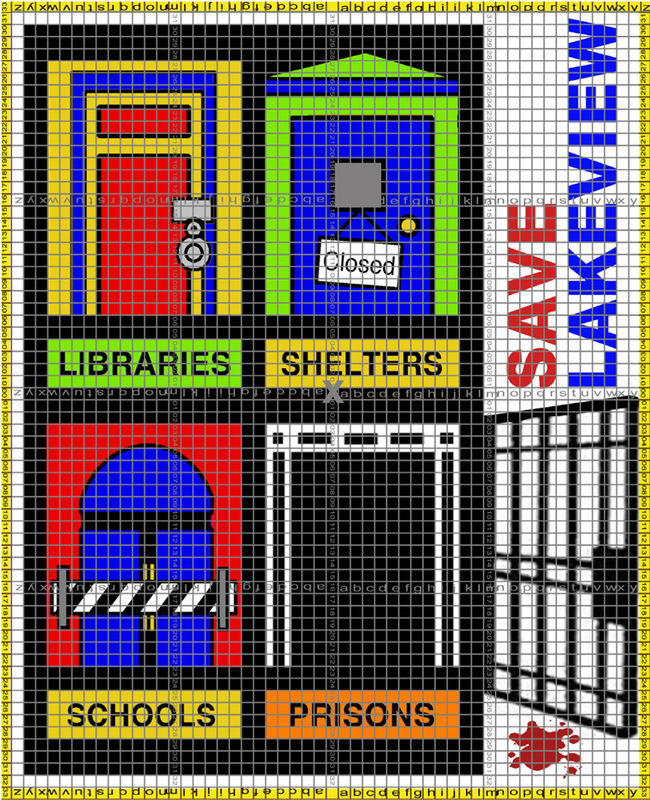 The most important thing about the design is that people like the message, and that it is attractive and feasible. There are a lot of ways to simplify the execution and you can experiment with things like stencils that we haven’t used yet. An important element of parties is freedom, so we give people who don’t want to chalk our designs their own, attractive chalk that they can use to do there own thing nearby. Most people are cool with chalking somewhere else if we give them the choice, aside from the occasional small child who has to be reminded. We have to deal that fairly often but that’s pretty normal for a party really. One little girl ate the chalk but luckily it was non-toxic. In order for it to be fun, the design must be easy to execute, in order for it to be easy to execute, the design has to go with the grid so that the grid works with it and not against it. The design can’t use too much of one color unless we have a huge store of it. We don’t want to run out, so things have to be planned around availability. Running out of water isn’t good either. The plaza has no running water so we bring about 8 gallons on average. We have a growing number of skilled and dedicated chalkers who we count on. Some of them are taking on more difficult challenges and teaching new people who join. Make the process as appealing to people and as easy to participate in as possible. You want the design to express some kind of shared, public sentiment. It has to be simple, have impact and aesthetics. It can’t be too hard to draw because it will take too long and become stressful. Beautiful, strong color is pleasurable just in itself. 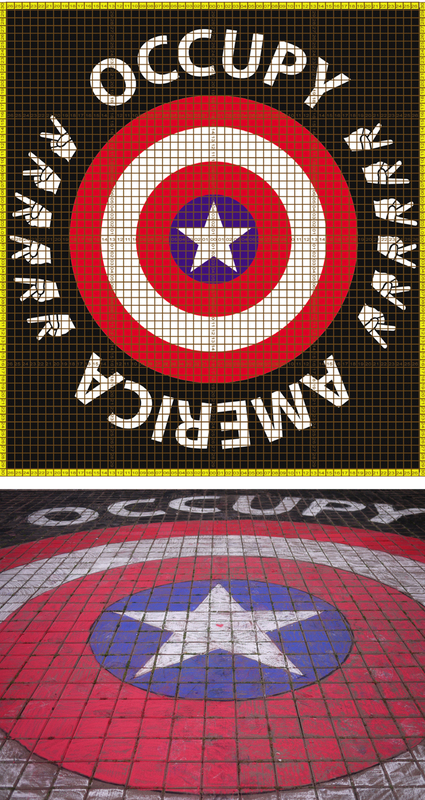 although the B&W First Amendment design was pretty popular. It’s important to count and measure your squares, know how many you have and how big they are. If there are no squares, you will still need to know the measurements, proportions and features of your space so that you can design something that will fit properly and work well with the environment. In this example, our chalking area is limited by a big metal plate that doesn’t take chalk well. We couldn’t really go wider than 33’ because of this limitation. Things don’t have to be limitations though. They can also be inspirational. Some elements can can actually be useful to your picture. 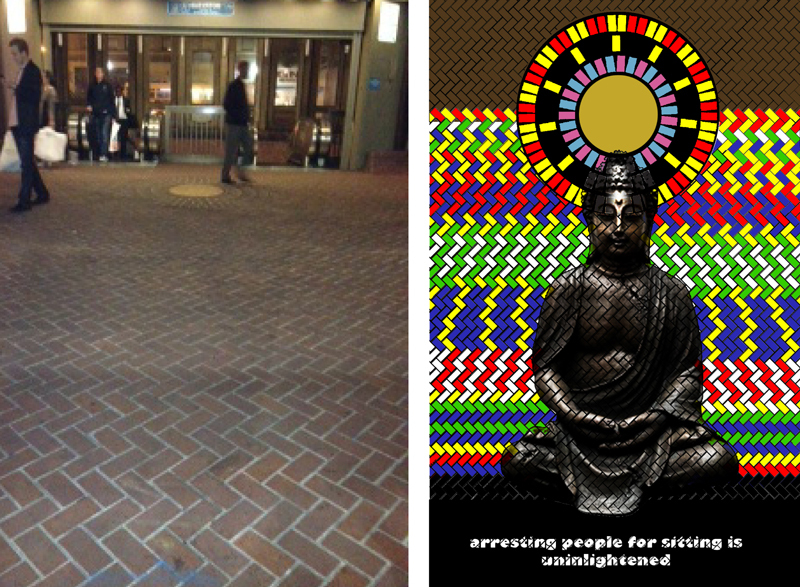 The manhole here became Buddha’s halo. We choose a simple designs that will read well and be easy to draw. This design just needed a compass and a straight edge. Use a grid for keeping track of large spaces. 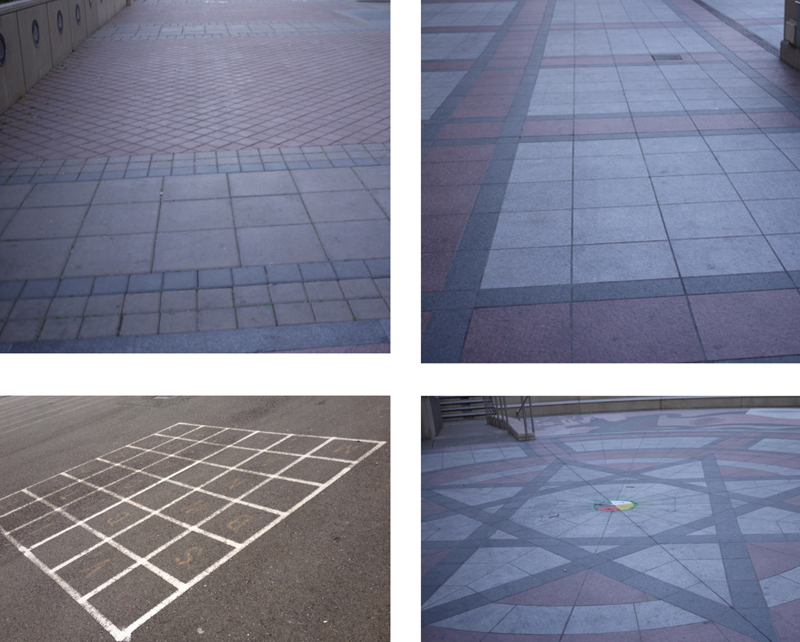 Below is a grid for our usual spot at Oscar Grant Plaza, in Oakland, CA. 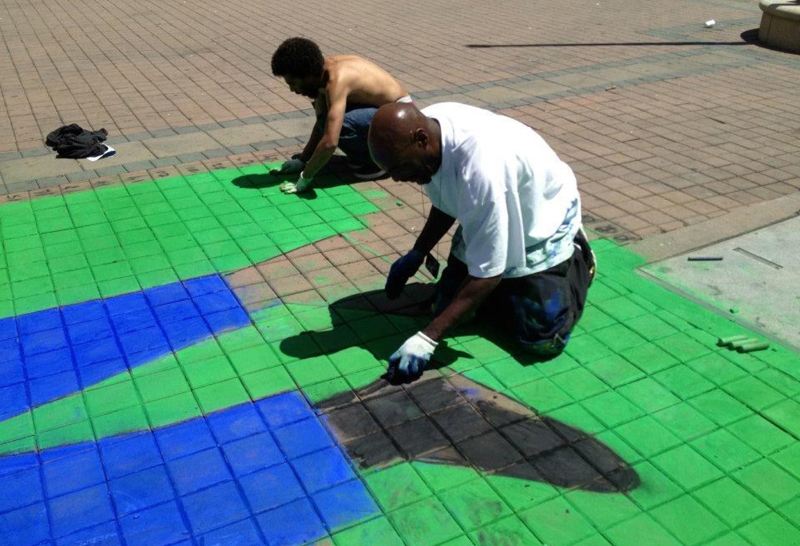 This is the map of the pavers at the SW corner of Pershing Square in downtown LA. These pavers are a lot bigger than the Oakland ones. 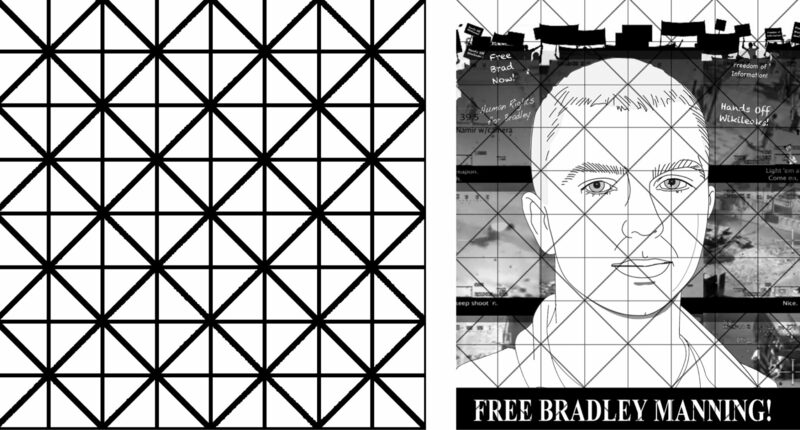 Line your design up to the grid as much as possible. 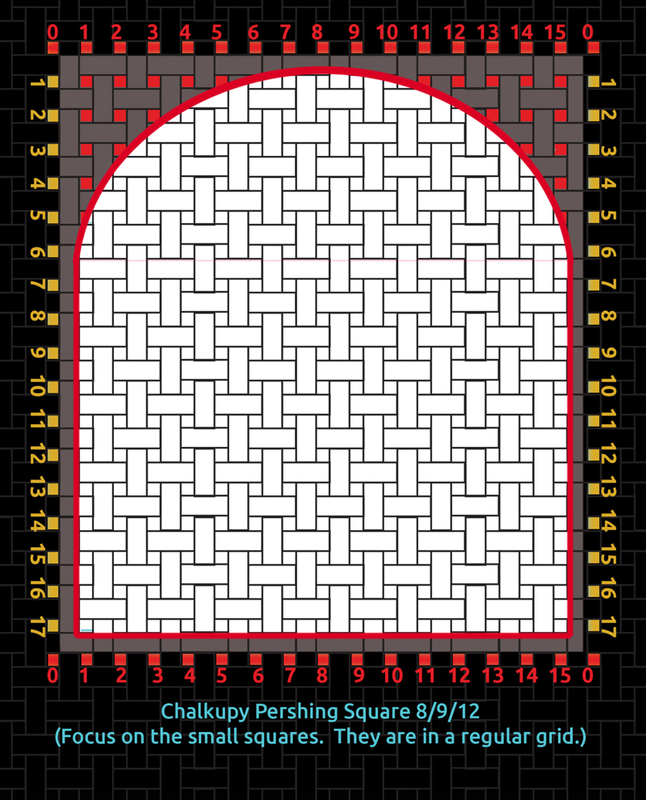 If there is no natural grid, make your own grid. 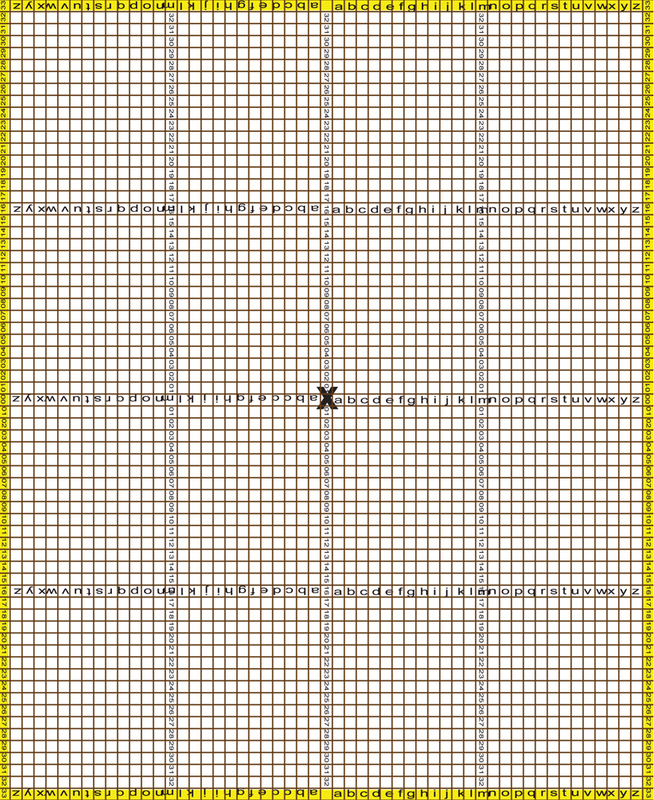 This can sometimes be better because you can make a grid that is the best size and shape for your drawing. Angles in faces are often closer to 45 than 90 degrees. Start by numbering the pavers. Then draw, trying to make sure that we create zones that people can start filling early on. We don’t want people to get bored, waiting around. 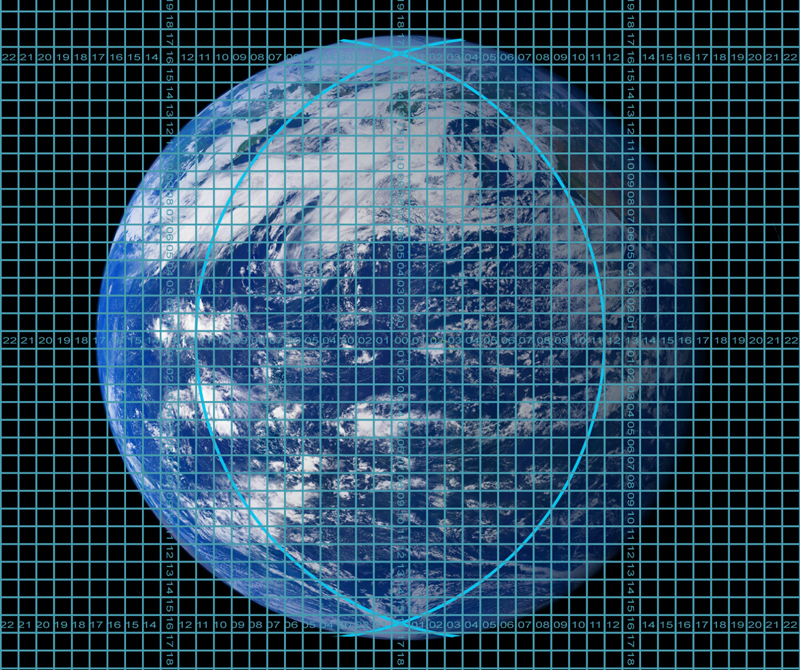 Snap lines make long, straight lines, triangles keep angles consistent. 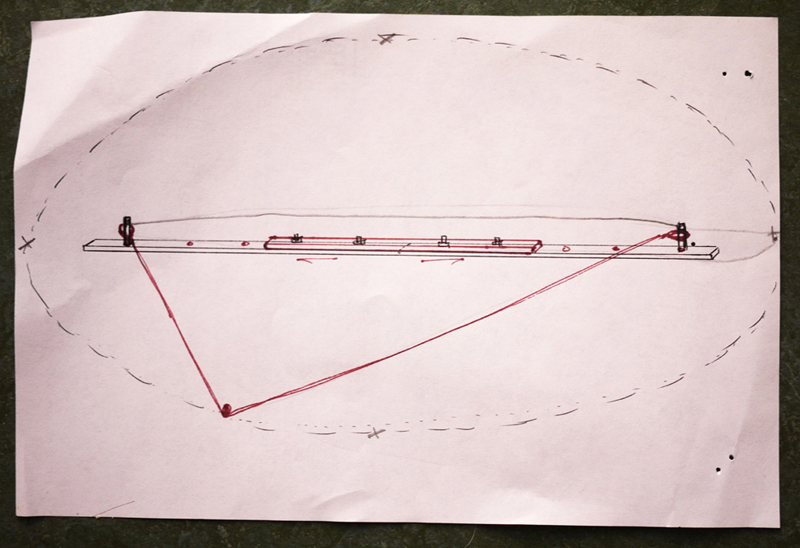 Below is a homemade, giant compass. T-squares can also come in handy. 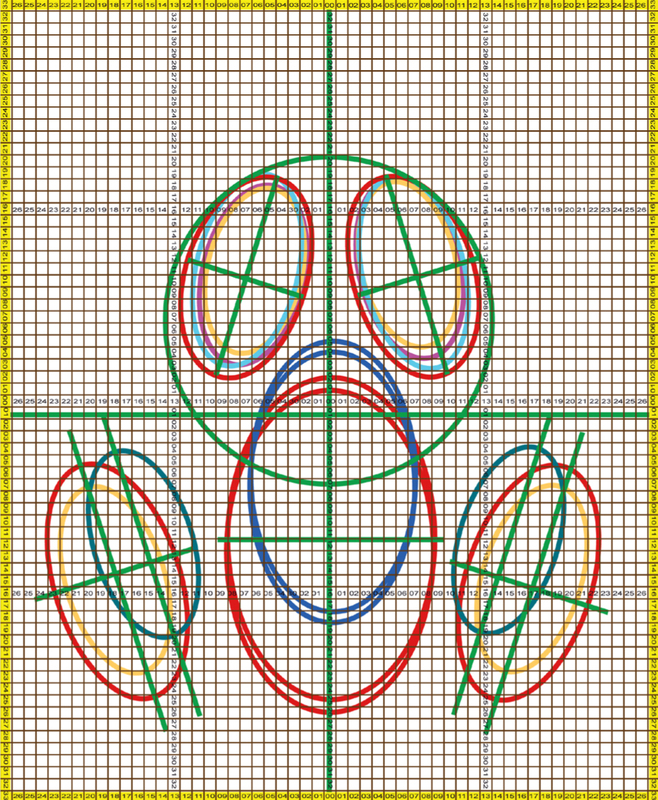 There is a neat trick for drawing ovals. See the link below. I used this technique and a cool oval tool to draw the gas mask. Link to Youtube how-to video. Picture of my tool. Not put together here. Diagram of how the tool works. Pixelating can keep things simple. If you want to pixelate your image, there is a filter in Photoshop that you can use. 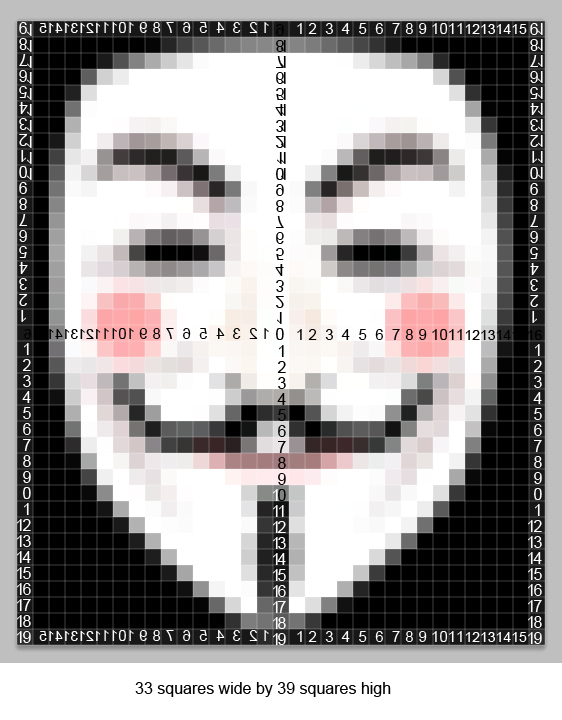 Go to Filter > Pixelate > Mosaic and it will produce squares. The filter gives you control of the size of the squares. Shading needs clearly defined color zones. If you are doing shading, you need a way to define the areas that are lighter and darker. That’s what I used the 2 turquoise curves above for. I made sure the drawing part would be easy and concentrated on keeping the right colors in the right zones instead. Provide written information and extra maps for anyone interested. People who walk by tend to have questions, so we made a stand with maps of the day’s chalk and written information. This helps us be able to keep working in spite of the fact that a lot of people have questions. 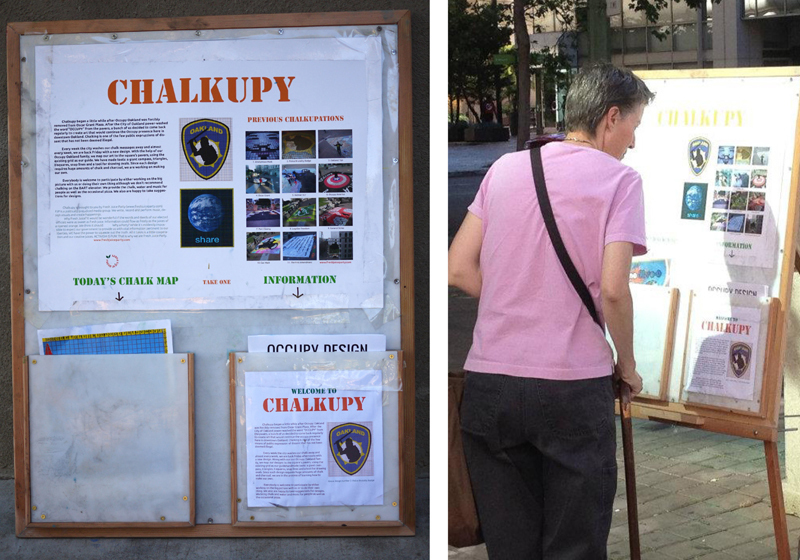 The info is also a way to recruit new chalkers, get publicity and to disseminate our message. It takes a lot of chalk to cover our 858 square foot plaza canvas. This means pounds and pounds of chalk. We are always almost running out. Running out is our most common problem or near problem. Our favorite brands of chalk are Prang and Eternity Chalk. None of the others are as bright and deep. Prang’s warm colors are better but Eternity’s blues are the best. A nice thing about Eternity is that you can order whatever mix of colors you want, you are not limited to just ordering fixed sets. You can order an entire case of just one color. Both brands can be expensive. A box of 12 Prang can run ~$15 the box of 72 Eternity Chalks is ~$65. To cover our 800+ feet, we usually spend about $200. This is our main social life so we don’t feel bad about spending ~$100 apiece for our weekly entertainment This includes juice and food. We use regular cooking charcoal for black which is a lot cheaper. Don’t’ use charcoal with kerosene though. You may want to bring gloves, coveralls, knee pads, pizza and lots of water for washing up. We mostly blend and erase with our rubber-palmed gloves. They work pretty well for that. 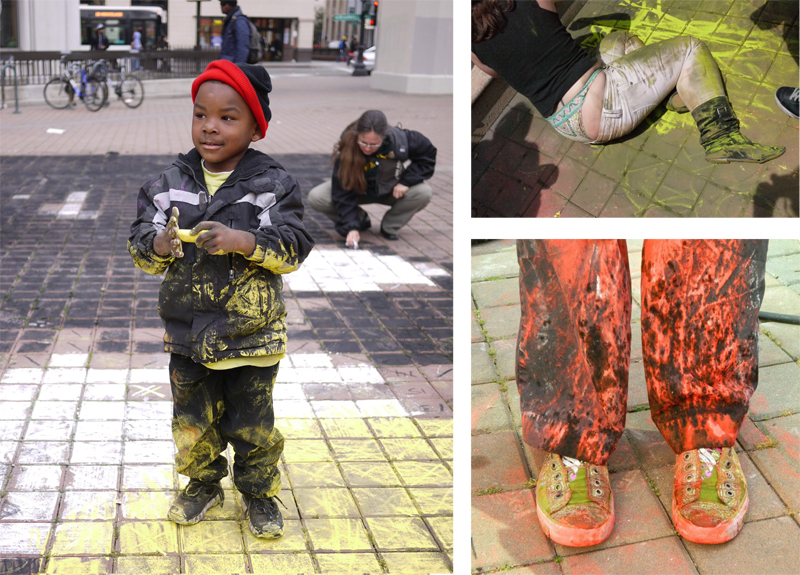 People can get dirty at Chalkupy. We are bringing about 8 gallons of water now and still pretty much going through it. 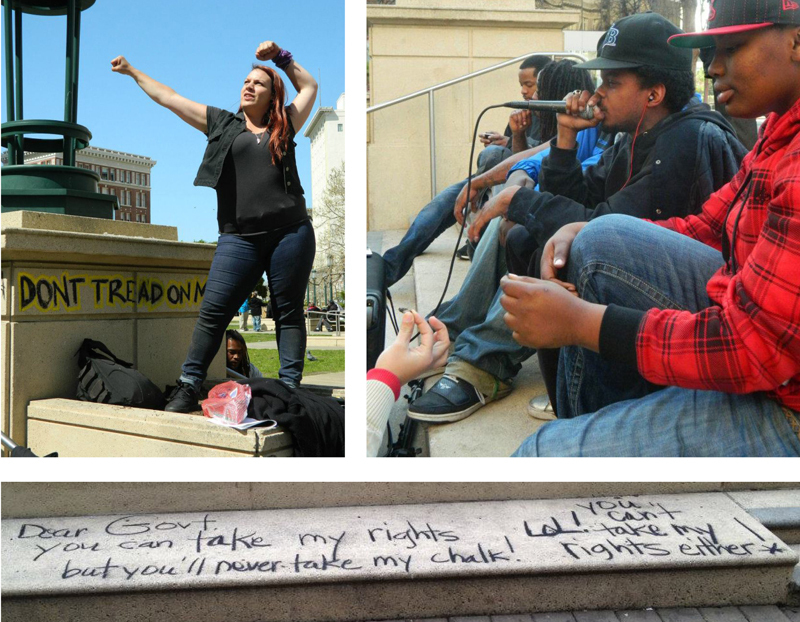 Chalking our messages shouldn’t be illegal but it’s possible to be detained for it. If somebody doesn’t like what you say, you could always be penalized regardless of the fact that you haven’t broken the law. Know your local statutes and be ready to argue them. 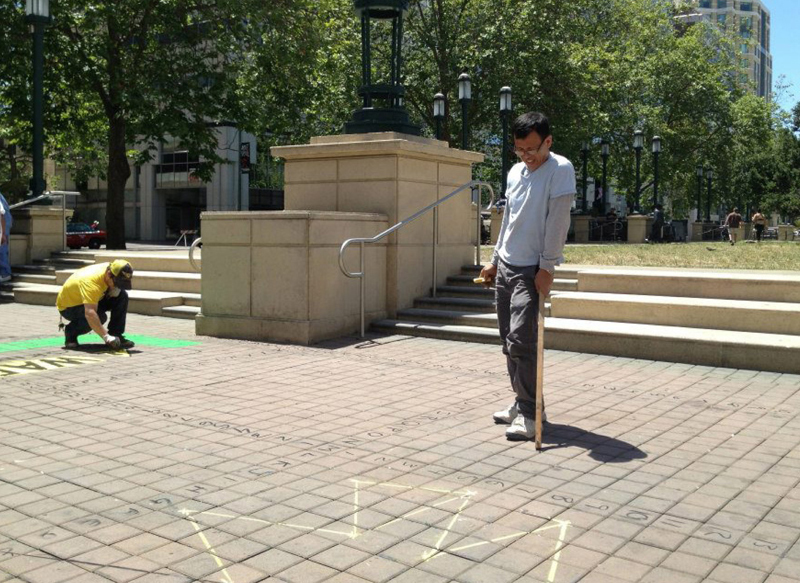 It also is a good idea to try and locate a city worker and ask them when your chalk area is cleaned. 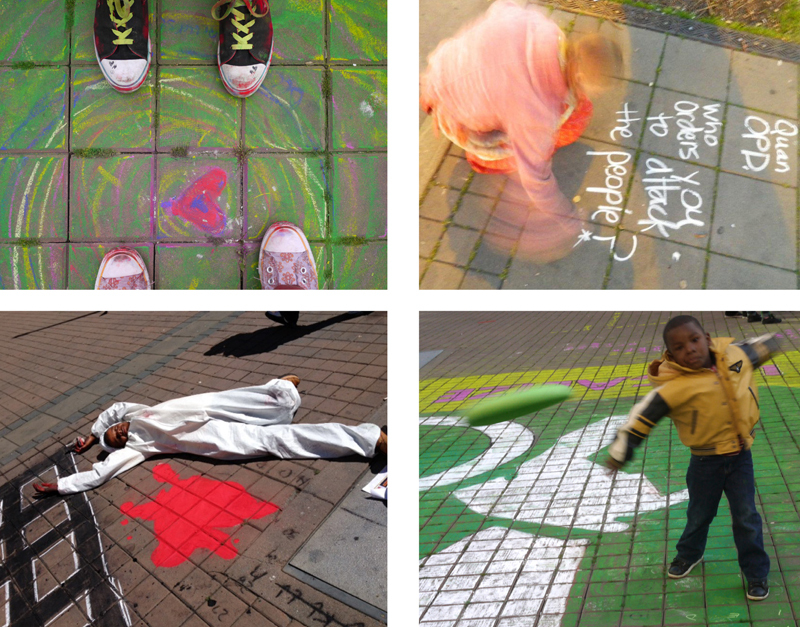 Public spaces are almost always cleaned regularly because of food and bodily fluids that are spilled there. The most common criticism you will get is that you are “making a mess” the argument that your space is cleaned regularly, especially when you have the time and day it happens, is a great counter-point. You might climb a flagpole or other structure to get a good angle. Or you can buy a drone or try and get into an adjacent building for a good shot. We’ve done all of the above. 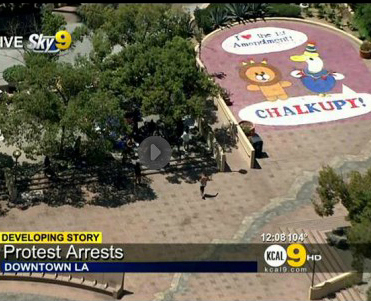 You can’t see a Chalkupation that well from the ground. It’s nice to get a press helicopter if you can.